This report reveals that hospitals are using a standardised review approach to learn from adult acute deaths and improve patient care. It cites a number of case studies, including two from the West of England (see main picture, above), where the structured judgement review process has made positive contributions to improving healthcare for patient. The National Mortality Case Record Review (NMCRR) first annual report (2018) cites a number of case studies where the Structured Judgement Review (SJR) process has made positive contributions to improving healthcare for patients. The SJR process reviews the care received by patients who have died. This allows learning and supports the development of quality improvement initiatives when problems in care are identified. Since 2016 the NMCRR has been implemented in over 100 NHS trusts and health boards across England and Scotland. The NMCRR team has trained around 480 healthcare professionals across England and Scotland, who in turn have shared their training with at least 1,500 other healthcare professionals including doctors and nurses. This process has been supported by AHSNS. During 2018 a toolkit was launched to support trusts in implementing a standardised way of reviewing the case records of adults who have died in acute hospitals. 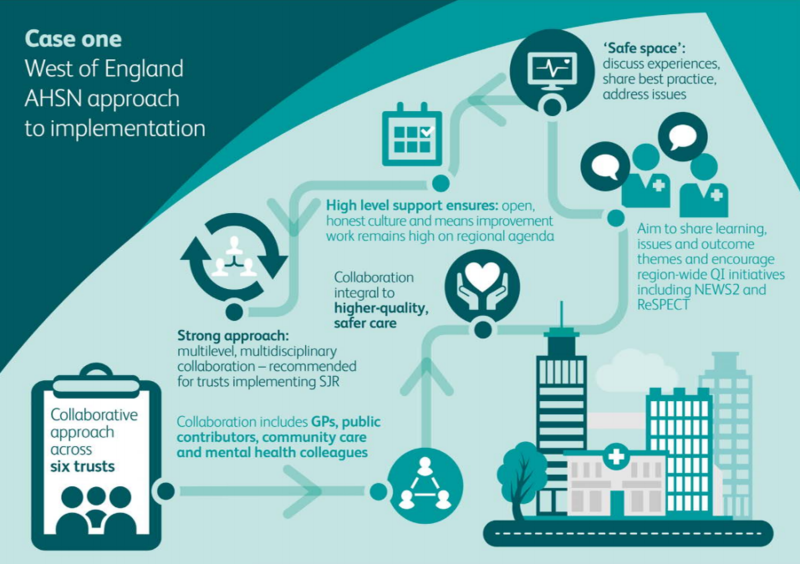 The development of the toolkit was a collaborative piece of work between the RCP, the Improvement Academy and the West of England AHSN. It aims to support the implementation of SJR at organisational level and the translation of emergent themes into practical quality improvement initiatives for real and lasting change. The toolkit brings together the learning from the NMCRR programme’s pilot phase, of which West of England AHSN was a pilot site, and from the Yorkshire & Humber mortality programme set up in 2013 which provided the foundation for the NMCRR programme.